My husband and son went to check the chemical balance in our swimming pool one morning, recently, and were astonished to see a dark creature swimming frenetically, deep in the water. Our swimming pool has pale water like the beautiful warm ocean surrounding the Whitsunday islands that we once swam in, so the creature was easy to see. At first, they thought it was a snake. A snake was not something we want swimming in our pool because snakes can be dangerous in Australia. So my husband went looking for a tool to fish it out with. By the time he got back, the creature had stopped and was resting on the bottom. It was quite obviously not a snake. It was actually a lizard, called a ‘water dragon‘. (Check out this link to view a video clip of our ‘water dragon’). We have often seen ‘water dragons‘ as they are common, here, but we had never seen one actually in the water before. We knew lizards could swim but we never knew they could swim through deep water like a serpent. 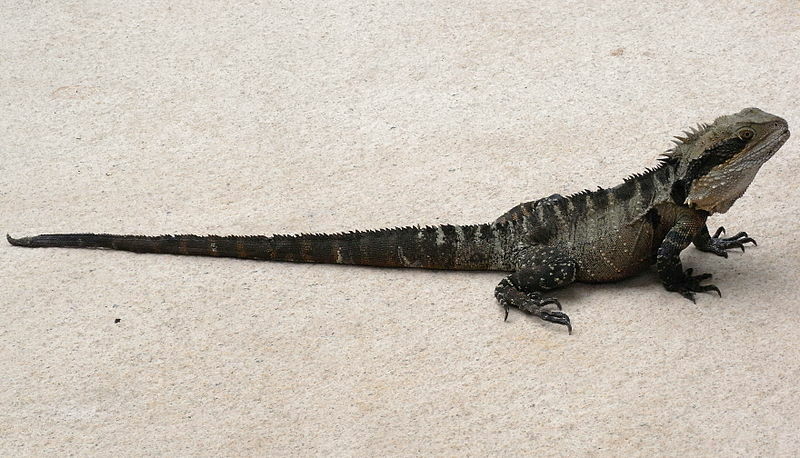 We love ‘water dragons’ but have never seen one around our home before. Usually, the lizards around our home are ‘blue tongues‘ or skinks, both of which are dry land animals. The weather has been unusually dry for some time, though, so water is probably scarce in the scrub where lizards live. We don’t mind sharing our resources with the wild life. Leaning toward the druidic in my spiritual modes, I also find meaning in such unusual visitations. I decided to look up the meaning of ‘water dragon‘ to see how it gelled with my life right now. In Celtic symbology, the dragon is a powerful magical animal that denotes transformation and eternal wisdom. There are four elemental dragons, for earth, fire, water, and air. The ‘water dragon‘ has a meaning of connection, depth and passion, as well as of memories and wishes that have possibly been long forgotten or hidden and are now being brought to the fore. I find this very interesting, since not long ago I began adding my own writing in our Lilipily Spirit blogs, here, and in that process have been remembering many events from my earlier life, both good and bad. It is said that the ‘water dragon‘ enables us to face the painful experiences of the past, so that a sense of peace and balance can be restored to our lives. Certainly, by writing blogs containing elements from my earlier life, I have been able to reconnect with the magic and wonder of many experiences that had long been smothered beneath the pain and suffering that ensued from other events. The ‘water dragon‘ is said to bring courage and compassion to help us face these challenges and I find that interesting since, before the ‘dragon‘ entered our pool, I was wondering why it was suddenly so easy to publically write things I usually feel vulnerable about. I definitely found the courage to put these memories, thoughts and ideas ‘out there‘ when they have not been aired for many decades. By the end of the day, the ‘water dragon‘ had gone. My husband and son felt a residual sense of wonderment and joy after the visit. If you are interested in the other elements when it comes to dragons, the ‘fire dragon‘ is known for transmutation, and enables enthusiasm, courage and vitality that helps us overcome obstacles, step up to the plate as a leader, and express mastery in the world. The ‘fire dragon‘ is also symbolic of powerful protection surrounding the circumstances we find ourselves in. Mythical salamanders are known as ‘fire dragons‘, but a more physical example would be any lizards living near volcanoes or volcanic mud. The ‘air dragon‘ is said to bring insight and inspiration, including powerful flashes of psychic illumination and clarity that can help us get to the bottom of all problems so long as we learn to trust our ‘inner voice‘. It is also said to foster a sense of vitality. Lizards that live in trees or high in the mountains are seen as ‘air dragons‘. In druidism it is believed that the Earth itself is a dragon and that its blood vessels create a network of lines in the land. These are known as ‘ley lines‘ (or dragon lines) and wherever they meet or cross a ‘power node‘ is said to exist. At these points, the Earth’s energy is strong and healing waters can often be found. Dragons did not have wings in druid lore but were known as wyrms (worms) and there were many stories about giant worms in the earth. (You can see how a lizard or skink might be considered a dragon when you understand they originally didn’t have wings). These giant ‘wyrms‘ or ‘worms‘ referenced the ‘ley lines‘ and the ancients are said to have built their sacred stone circles upon the ‘node points‘ in these, including the well known Stonehenge. When the ancients talked about the ‘lay of the land‘ they weren’t mapping just geological structures but were referencing this network of power. Since the word ‘dragon‘ means ‘to see clearly‘ and the ancients believed that the special powers of vision, wisdom, prophecy and knowledge were birthed from the Earth at these power nodes, such special places were under the guardianship of kings who were known as ‘Pendragons‘ (protectors of dragons). The nodes are also said to have been portals between our world and the supernatural or ‘otherworld‘. Since the druids believed in reincarnation, crossing through such portals was a regular occurrence at the beginning and end of each lifetime. This reincarnational cycle is symbolized in the image of a dragon swallowing its own tail, denoting the never ending cycle of life, and it was very important that nothing blocked the exchange between worlds or opened the portal at the wrong time. Which was another reason for dedicating such points as sacred sites. I’d like to think that the little ‘dragon‘ in our pool was attracted by the energy coming from our land, and that it found the water in our pool healing. I remember walking across our plot soon after clearing work had been done many years ago and when the scaffold of our home was going up. An elemental energy rushed through my body with a clear sense of entity. I told it not to worry and said that all the plants and trees we had removed would be replaced – that it would have its garden back again. Thus appeased, I’ve often found it interesting since that every shrub or tree I planted grew much bigger than the potting labels said they would. I’ve also often been reminded of the entity protecting our land when so much wildlife, and insects like butterflies and dragonflies, have enjoyed passing through despite our land being only one suburban plot amid many. Over time, I came to believe that our spiritual rituals and the blessings we laid upon our home and land might also be the attractors, but perhaps it was the land itself all along? My eldest son and I were born during the season of Imbolc, which is a fire festival. In the Celtic zodiac, this means that our signs are dragons. In the southern hemisphere, where we were born, the dragon rules the period between July 21 to August 17. In the northern hemisphere, it rules the period between January 21- February 17. It’s also interesting to me that the Druid tree for this period is a rowan. I have a few mountain ash trees (also known as rowans) growing along the borders of our land. Birds often use our pool as a giant bath when we’re not out there (which is why my husband is assiduous with keeping the pool chemicals balanced). Our dining table overlooks the pool and it’s lovely watching them take a dip. There used to be a group of four laughing kookaburras who sat on the fence and took turns to have a flutter in the pool each day, but then the mock orange hedge grew to thirty feet (instead of the ten on the tag) and they had nowhere to sit any more. That hasn’t stopped beautiful blue winged smaller kingfishers and other birds dropping by regularly, though. I hope we see the ‘water dragon‘ come back one day. (The birds had better be on the alert, then). Next time, I’d like to be there, too.